A dollhouse that is! 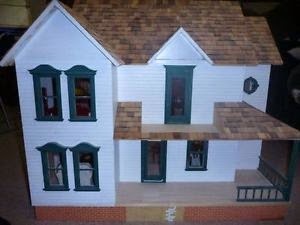 I've wanted to buy a 1:12 scale house for awhile, but I wanted it to be assembled. I enjoy decorating dollhouse interiors, not assembling dollhouses! A couple of weeks ago I found this promising little property on kijiji. I'll decorate it fairly conventionally, a bit at a time, as I can afford to. I know I promised everyone pictures of miniature baking. The final cake I was planning to include burned! I want to remake it sometime this week. Things have felt super busy lately since I started working as a part time nanny, taking care of twin baby girls who just turned three months old. I love my job, but it does wear me out some days. Here are some pictures of my new dollhouse. That's all for today folks! Hope everyone is doing well. Yeah I decided that I will buy most of the furniture but make most of the accessories. I love those twins :) I would do that job for free! What a great house, it kind of reminds me of the Anne of Green Gables house! What fun you are going to have with that, can't wait to see how you decorate it. Stop by sometime and see my dollhouses, isn't it so much fun? I know, one of the first things I noticed is that it is like the Anne of Green Gables house! I love the Anne books and have always wanted to do a scene from one of the books (my sister suggested the scene where Diana gets drunk on Raspberry Cordial) Welcome to my blog! Congrats on the house and the part-time job too! Especially if the twins make it fun. I think decorating the house one room at time will really showcase the personalities of the room. Thanks Brini! God help me when those twins start to walk! Right now I can still put them in bouncy chairs :) I will definitely have fun with this house. Yes, there will be lights! It's already wired for lights. I don't quite understand how that works but it has that copper strip lighting and the lady who sold it to me gave me the instruction manual. I like your dollhouse. Enjoy! Hi Ruth! I am so encouraged that you are in better health and it sounds like you love your nanny job! One baby is a lot of work so I admire you taking on 2. Not easy, but the twins will be blessed because it is You doing the caregiving with love. A Great and "Novel" idea! Thanks Elizabeth. I agree about the house. Perfect size. Not too big or too small! Oh fantastic! now you have a wonderful project to work on over time and add all your wonderful minis to! Yeah it will be fun to decorate for sure. I already love looking at it! That's a big house. Very pretty exterior! This project will keep you busy for a while! Such a beautiful house you got hold on! Good luck with it! I'm sure it will be great!